Hi teachers! 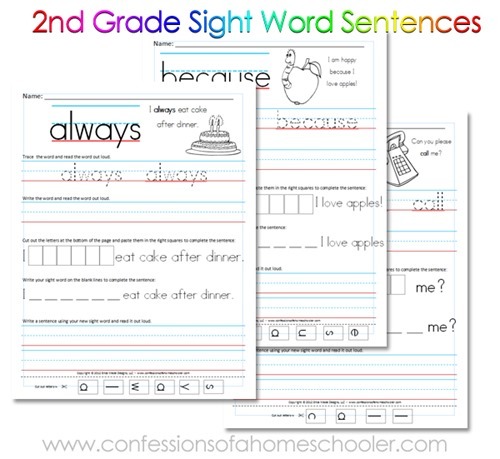 Are you looking for a fun way to have students practice their sight words? Look no further! I’ve had a ton of requests for some more of my sight word sentences, so today I’m sharing the second grade sight word sentence printables with you. Each worksheet has the word along with a funny sentence. Students will practice tracing the word, reading the word, then writing it on their own. Students will also cut out the letters then glue them on the sheet to spell the word correctly to complete a sentence. This activity is great for fine-motor skills and spelling practice! Next they will write the word to complete the sentence. This download includes 46 Second grade level sight words from the Dolch sight word list. Wow! Thank you for this set!! You have given me so much encouragement and plenty of ideas while I begin the huge journey of homeschooling. I look forward to your blog so much! Thank you, Erica! This is wonderful. My 2nd grader is really struggling with spelling, so we have been trying to find ways to fix the problem. This is definitely a help! These are so wonderful!! Thank you so much for all your hardwork AND for allowing so much to stay free. I love your blog. I have learnt so much from it. And I esp love these sight word sentences pages. I have just one suggestion. The height of the sentence lines can be reduced a bit. Its too wide for 2nd grader, causes them to write really big words, when now they can start pratising a little smaller size writing. Thank so much for your generosity! I love the ideas and practical materials that you share. WOW, this is wonderful. I absolutely love your sight. I’m not a homeschooler, but I love that I can reinforce what my son is learning and will learn this coming school year. Now that we are in the summer, I can get him started on 2nd grade sight words before the school year begins. You are my favorite!! Thanks for sharing! !